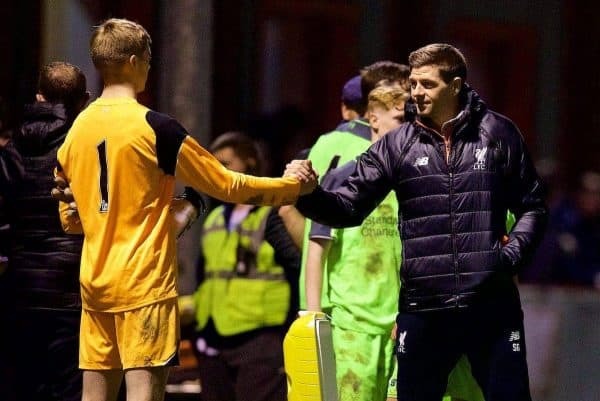 Jurgen Klopp has confirmed Steven Gerrard’s promotion to a coaching role in the Liverpool academy next season, expected to be with the under-18s. Gerrard has been operating in a fluid role at Kirkby since February, with the former Reds captain finding his feet after his retirement from his playing career. But having already impressed the likes of Klopp and academy director Alex Inglethorpe, Gerrard is ready to step into a more defined position. That is reported to be as coach of the Liverpool U18s, with reports suggesting the 36-year-old will take over from Neil Critchley from next season. And, speaking on Thursday, while Klopp would not reveal whether that would be Gerrard’s next role exactly, the German did confirm he would be leading one of the Reds’ youth sides from 2017/18. “There is not a real announcement in this moment, but what I can probably say is ‘yes’,” he told reporters at Melwood. “He is doing a real job at the academy at the moment with his presence and everything, being around and giving advice and leading little or bigger sessions and all that stuff. “They all enjoy it a lot. He especially enjoys it a lot.